Meet Grohtherm SmartControl, a major new development in exposed thermostats, offering you ultimate reliability and precise control for your bathroom. 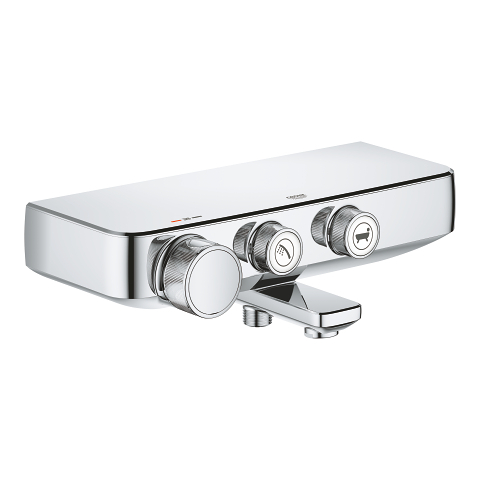 Grohtherm SmartControl is available as a separate unit, designed to combine perfectly the good looks you would expect from any GROHE product, and the intuitive, easy comfort of SmartControl. 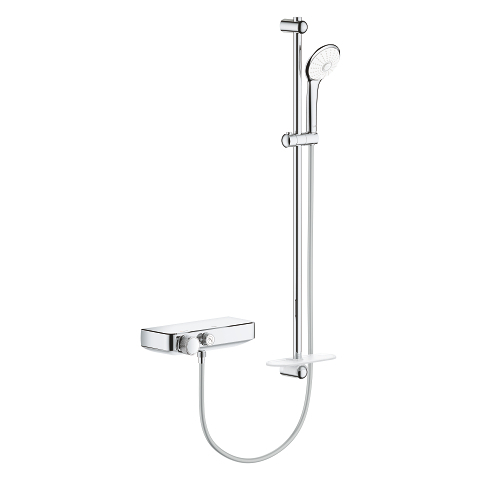 Grohtherm SmartControl is available as a shower thermostat, with one SmartControl button; a bathtub thermostat, with two buttons, for the bath spout and hand shower; or as part of a shower set, in combination with a 600mm or 900mm shower rail and Euphoria 110 massage hand shower. The exposed design of all Grohtherm SmartControl versions makes them easy to install in any bathroom, ideal for an upgrade. 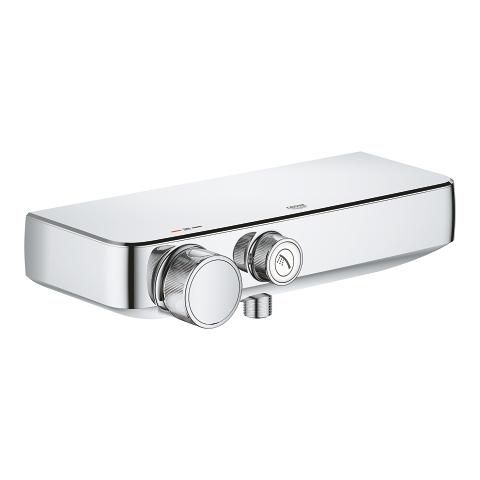 Grohtherm SmartControl is the innovative shower control which lets you adjust the volume and temperature effortlessly. 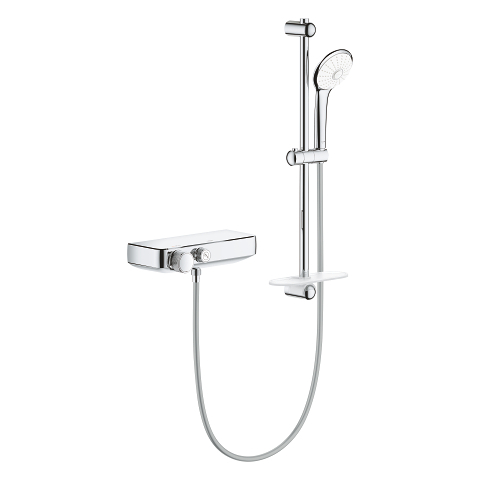 It also lets you select your preferred spray and switch between head and hand shower or bath tub filler. 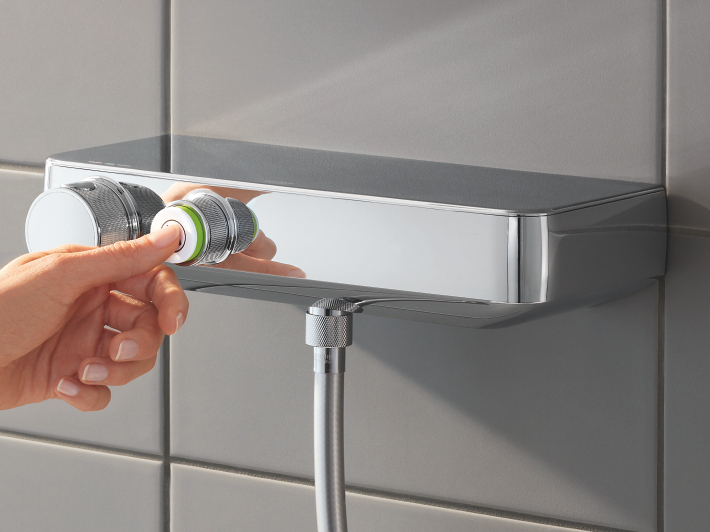 Simply turn the ergonomic GROHE ProGrip handle to increase the volume – from Eco to Full Flow - and turn down to reduce it. You can even press to pause the water. Grohtherm SmartControl even lets you store your preference for the next time. 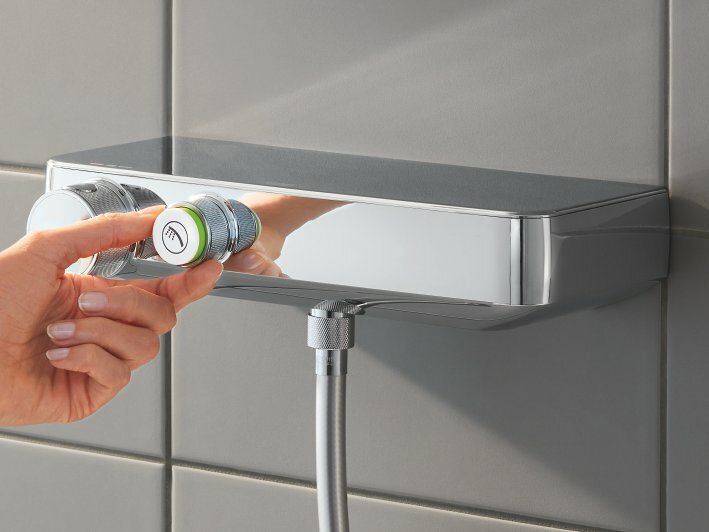 Grohtherm stands for total reliability, thanks to GROHE TurboStat, technology which ensures that your desired water temperature is reached within a fraction of a second. Once flow you can be sure of a constant temperature – so no nasty surprises. 100% CoolTouch means that the surface of the Grohtherm SmartControl thermostat is always stays at a safe temperature for you to touch. With Grohtherm SmartControl you can fit your dream shower into even a small space. The clean-lined, compact design leaves plenty of space under the shower, and its smooth top has been designed to be the perfect place to store toiletries close to hand. Add to this the simple, intuitive icons on the SmartControl buttons and you’ll see that the design of Grohtherm SmartControl exudes chic looks and effortless practicality.